Using a large spoon or your hands, thoroughly combine meatball ingredients in a large bowl. Roll meatball mixture into 1 to 1 1/2-inch balls (about 60 meatballs total) and space meatballs evenly on baking sheets lightly brushed with vegetable oil. Cover meatballs and place baking sheets in refrigerator for at least 1 hour to chill. Preheat oven to 375°F. Uncover chilled meatballs and bake 30-35 minutes or until fully cooked. Meanwhile, make the gravy: In a large skillet or saucepan over medium heat, add butter and flour and whisk until a smooth paste forms. Pour in beef stock and bring to a simmer. Whisk in sour cream and add half the meatballs. Reduce heat to medium-low and cook 10 minutes. Remove meatballs and replace with remaining half; cook another 5 minutes or until gravy thickens. Transfer meatballs to a serving dish. Season gravy with salt and pepper to taste and pour over meatballs. Top servings of meatballs with fresh minced sage and a dollop of lingonberry jam on the side, if desired. Besides the allure of new furniture, pretty textiles and the challenge of pronouncing their names (“Fyrkantig, “Flardfull” and “Smorboll” are a few of my favorites), nothing draws me and the husband nearer to IKEA than the promise of their Swedish meatballs. Of course, there’s nothing quite like the home-cooked version, either, and my grandmother-in-law (whose family hails from the land of the Swedes) makes some of the best I’ve ever tasted. This recipe for Sage Swedish Meatballs is loosely based off of her personal recipe, with fresh sage for an added savory, earthy flavor. 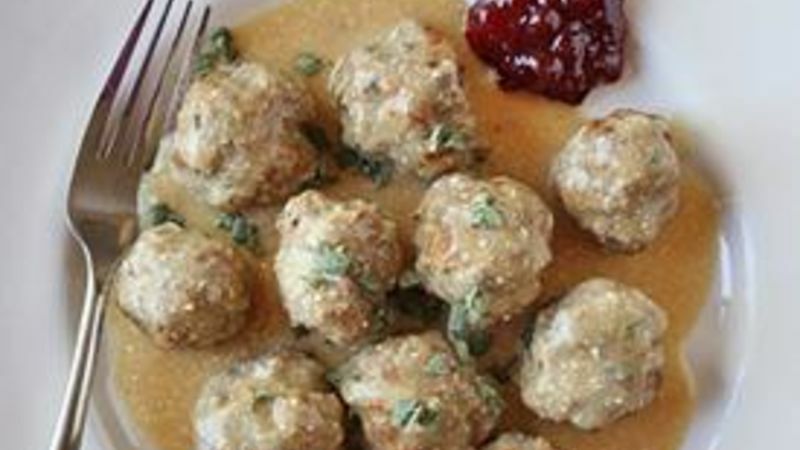 If you haven’t had the pleasure (or, ahem, adventure) of going to IKEA and trying their meatballs or you’re craving a solid Scandinavian meal at home, this simple, comforting dish is worth a try. Pour all your ingredients for the meatballs into a large bowl. I love the combination of flavors rendered by ground beef and ground pork, so I use both – but if you can’t find ground pork or have an aversion to it, using all ground beef is fine, too. I also throw in a bit of chopped fresh sage, which gives the meatballs an extra, unique flavor that I really love. Mix all the meatball ingredients together, then roll it all up into 1 to 1 1/2-inch balls and place them evenly on lightly oiled baking sheets. You should end up with about 60 meatballs, which feeds a crowd (or if you’re like my meatball-monger husband, about 4-6 servings). Cover the meatballs and let them chill in the fridge for about an hour. When the meatballs are done chilling, uncover them and bake them in the oven for about a half-hour. Meanwhile, make the gravy on the stovetop. Mix together butter and flour in a ginormous skillet to make a paste. Then, add beef stock, whisk and bring to a simmer. When the meatballs are fully cooked, add half the batch to the gravy along with some sour cream. Let the whole thing simmer over medium-low heat for about 10 minutes, then remove the meatballs and replace them with the second batch. Let the second batch simmer in the sauce for another 5 minutes or so, until the gravy thickens. Finally, place a few (or a mountain) of meatballs on a plate, spoon the gravy over the top and sprinkle with fresh sage. Place a dollop of lingonberry jam on the side. You won’t be sorry. There you have it! Comfort food fit for a Viking. Or anyone who loves a good meatball.